Orthopedisch chirurg (UZ Leuven) sedert 2005. Postgraduaat fellowships in heup- en kniechirurgie in Perth (Australië) en aan UZ Gent. “Een osteolytisch letsel van de patella?” Dr T Vancauwenberghe, Dr F Vanhoenacker, Dr J Bosmans, Dr J Myncke. Ortho-Rheumato, 2014; 12-3: 9-11. “ The influence of freezing on the tensile strength of tendon allografts: a biomechanical study”. Dr N. Arnout, Dr J Myncke, Dr J Vanlauwe, Ir L Labey, Daniel Lismont, Prof J Bellemans Acta Orthop belg, 2013, 79, 435-443. ‘Imaging of femoroacetabular impingement: pictoral review”. Peeters J, Vanhoenacker FM, Marchal P, Mulkens T, Ghysen D, Myncke J, Van Dyck P, Gielen JL, Termote JL, Parizal PM. JBR-BTR, 2009; 92:35-42. “Missed cause of hiparthrosis in young patients”. J Peeters, F Vanhoenacker, J Myncke, P Parizel. OrthoReumato, 2008; 2(6): 46-48. “Migrating Symptomatic Bone Marrow Edema of the Knee: a case report and review of the literature”. Feyen H, Myncke J, Vanhoenacker F. Acta Orthop Belgica, 2008. “Forth International Hiparthroscopy symposium” together with Belgian Hip Society and Nederlandse Vereniging voor Arthroscopy. Dr J Myncke, Dr J De Schepper, Dr F Bataillie, Dr J Van Melkebeek, Dr J Somers. 24-25/11/2011, Ieper. .“Third hiparthroscopy symposium” together with Belgian Hip Society. Dr J Myncke, Dr J De Schepper, Dr F Bataillie, Dr J Van Melkebeek, Dr J Somers. 5/12/2009, Herentals. “Hipartroscopie: Principles of femoroacetabular impingement, literature and protocol” Dr J Myncke, Dr J De Schepper, Dr F Bataillie, Dr J Van Melkebeek. Presented at ABA congres, 20/10/2007, Lille. “The influence of multiple freezing on tensile strength of tendon allografts: a biomechanical study”. Dr J. Myncke, Dr J. Vanlauwe, Prof Dr J. Bellemans, Ir. L. Labey, D. Lismont. Presentation on Resicence day, June 24, 2005, Pellenberg, Belgium. “Preliminary results of the use of a collagen meniscal scaffold in combination with grade 4 cartilage lesions” Dr J. Myncke, Dr K. Lagae. Presentation on the international ABA congres, October 2, 2004, Brussels, Belgium. 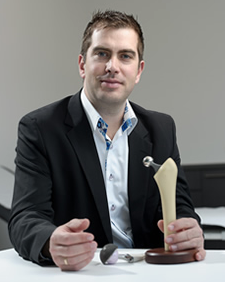 “Preliminary results of the use of a collagen meniscal scaffold: an option to prevent arthritis in the young patient’s knee?” Dr J. Myncke, Dr K. Lagae. Poster presentation on the annual congress of the Belgian Orthopaedic Society (BVOT), June 10-12, 2004, Alden Biezen, Belgium. “Emergencies in orthopaedics” Teaching a postgraduate course (operating theatre, intensive care unit) at the School for Nursery, 2003 and 2004, Stuivenberg, Antwerp. “Anterior cervical fusion for disc herniation: a retrospective study by 8 different evaluation methods” Dr F. Bataillie, Dr J. Myncke, Dr J Van Roy. Presentation on the 14° Annual meeting of the Cervical Spine Research Society, European section, September 1998, Varese, Italy.